A selection of 3 Star and 4 Star guest houses and bed & breakfasts in Jersey are listed below. 14 Guest Houses and 1 Bed and Breakfast. 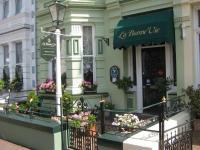 Bay View Guest House offers 4 star Guest Accommodation near St Helier. It is just a short walk to St Helier town centre (approx. 10 minutes). Bay View Guest House is located on the coast road close to Havre de Pas, near the sandy beach and open air swimming pool/ lido. Near the main bus route. We aim to provide our guests with a comfortable 'home from home' experience. Lyndhurst Guest House is situated on the South Coast of Jersey overlooking Elizabeth Castle and St Aubin's Bay. Lyndhurst Guest House is ideally located for charming walks, cycle routes and sea sports and minutes from golf courses, so makes the perfect base for an outdoor or golfing holiday in Jersey. 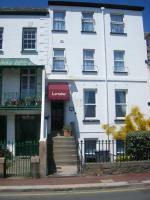 Lyndhurst Guest House in Jersey offers 11 en-suite bedrooms with family rooms available, as are sea view rooms. Ocean Walk Guest House in Jersey overlooks the sandy beach of St Aubin's bay (only 40 metres away). The guest house is on the main bus route so it's easy to travel into St Helier town centre. All of our rooms are en-suite with Tea/coffee facilities, TV and Wi-Fi. Family rooms, sea view rooms and single rooms are available. 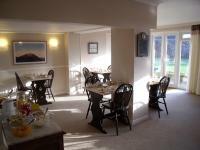 Full English or continental breakfast is served in our dining room. There is a small private car park. 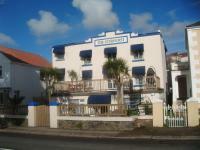 St Magloire Guest House is situated in the picturesque fishing village of St Aubin on the South Coast of Jersey. The family-run 2 star guest house overlooks the bay, harbour and Elizabeth castle. The St Magloire Guest House has 12 en-suite bedrooms with Twins, Doubles and large Family Rooms. All rooms have TV's, tea/coffee making facilities and there are some Sea View rooms. Bus stop is just a 5 minute walk away.